It follows an incident at Glasgow's Braehead shopping centre when security guards challenged a man who had taken a photo of his young daughter. 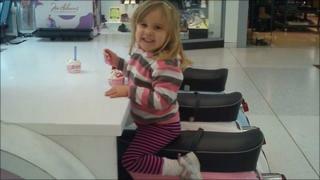 Chris White was questioned by police after taking a photo of four-year-old Hazel eating an ice cream on Friday. Capital Shopping Centres said the new rules would apply immediately to its 11 UK shopping centres. These include Braehead, the Trafford Centre, near Manchester, Lakeside, in Essex, and the Metrocentre, in Gateshead. It said the policy was also likely to be adopted at three other centres in which it is a partner, including the Mall at Cribbs Causeway in Bristol. Staff will no longer try to prevent family and friends taking pictures of each other, although security guards might still challenge anyone acting suspiciously. Mr White claimed that, when he was interviewed by police, an officer warned him that anti-terrorism powers meant his camera phone could be confiscated. In response Mr White set up a Facebook page called "Boycott Braehead" which, by Tuesday morning, had been "liked" by more than 21,000 people. In a message posted on the Facebook page, Mr White said he would continue to press for other shopping centres to change their policies. He wrote: "Hopefully we can now move forward with a common sense approach into a situation that allows families to enjoy precious moments with their children, but at the same time ensure that such public places are areas where we can feel safe and protected. "I have been overwhelmed by the public response on this issue and thank everyone for their support." Capital Shopping Centres, which also owns malls in Cardiff, Manchester, Newcastle, Norwich and Nottingham, said: "CSC can confirm that we will be changing the photography policy at our 11 directly owned centres and that at the other three centres, which we own in partnership with other companies, we will be discussing with our partners the policy change and recommending that it be adopted." Mr White said Braehead had now written to him to apologise "for the distress that we may have caused you and your family". Strathclyde Police said they were reviewing their involvement in the incident but a senior officer pointed out that no-one was arrested and no action was taken against Mr White. Supt George Nedley said: "I can confirm we have received a complaint regarding this incident and one of my senior officers has spoken to Mr White regarding this. "As a result a full review of the circumstances surrounding the incident and the allegations made is under way."